In all regions, young people belonging to minorities are affected by specific barriers to access to education and to employment on an equal footing with the rest of the population. This discrimination maintains them and their communities in a state of economic and social disenfranchisement. Minority youth are also at the forefront of the fight for equal access to education and equal economic opportunities, which are preconditions to their full and effective participation in the economic and social life. 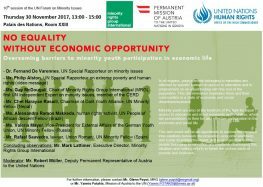 This side event will be an opportunity to explore the complex inter-relations between discrimination, economic exclusion, and social disenfranchisement, and to discuss how young people belonging to minorities are creatively challenging this situation and making efforts to break the vicious circle of poverty and exclusion.